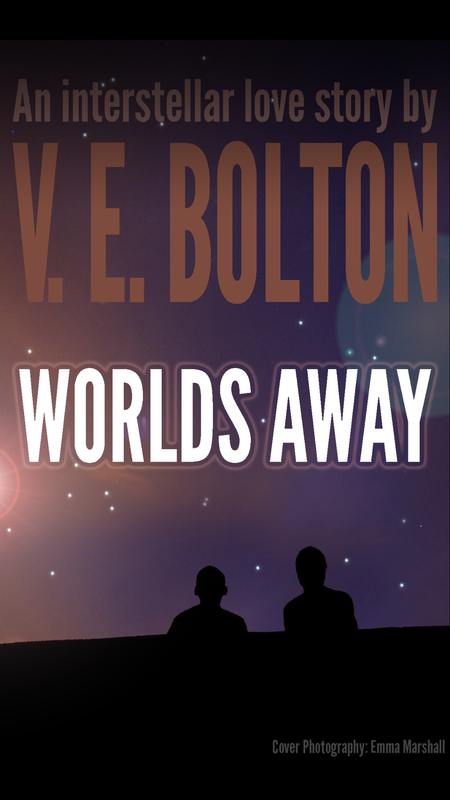 Worlds Away now available in paperback! The novel has had a lot of positive reviews so far. See what all the fuss is about by looking here. It really is the best feeling. I read a post from a blogger yesterday, who said that making money from a book is secondary to the buzz it gives you. I could not agree more. Reading things like this, from total strangers, makes every tortured, writers’-blocked hour worth it. My debut novel is now available in paperback and as an ebook! Overpopulation has pushed planet Earth to breaking point: the Expansion is taking up every available resource, or at least according to the Panel. Luckily, they have the perfect solution. Their rigorous intelligence test will sort people into Supplementary Humans, who exist only to serve, and Betters, who lead the Cause. 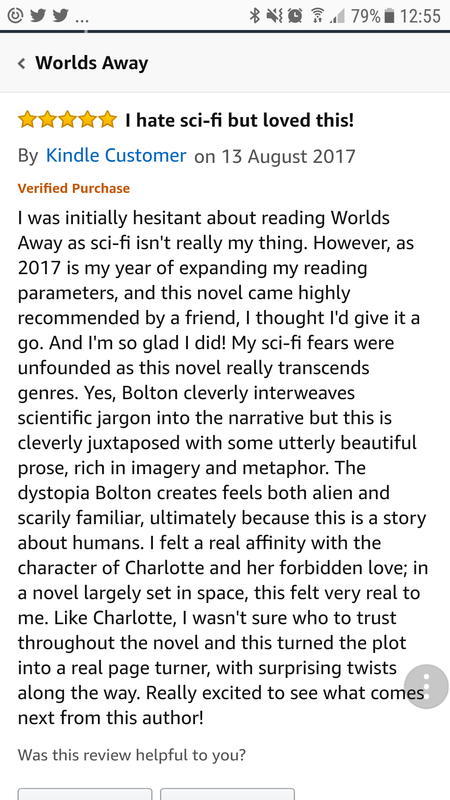 Many believe the Cause to be lost, but Charlotte Dobson alone has the answer, and it lies at the heart of the fabled planet, Oscar 70. Little does Charlotte know that this discovery will challenge everything she knows about the universe, including the outdated notion of ‘love,’ and the fabric of time itself. First and foremost, I think that Worlds Away is a novel that is all about barriers. 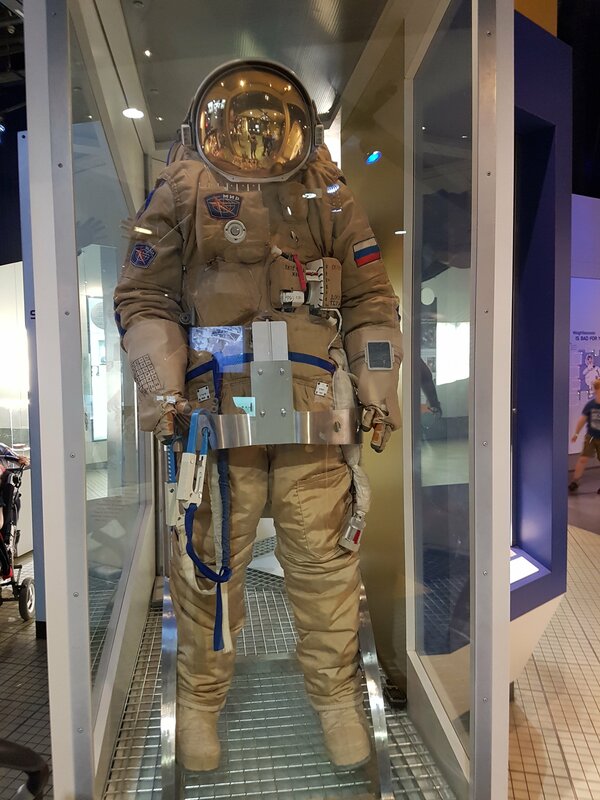 Wherever you turn, there is some kind of physical barrier, be it a window, a photo frame or light years of space. Now, I need to be a little anally retentive about this: this symbolism did not begin deliberately. Steven King (who, let’s be honest, knows more about anything than we mere sapients) said that our job as writers is not to find themes or ideas, but to “recognise them when they show up.” And, honestly, that is what happened. I started writing a dystopia about social injustice – which is perhaps linked to our current education system – the least said about that the better – and it became a book about barriers. Don’t you hear my call though you’re many years away? Perhaps it is important that I was spending our annual Boxing Day party at my parents’ house the night I first heard this song, and it is often a time for nostalgia, clawing back to a time you can never reach again. How many barriers have I mentioned now? I heard that song for the first time in Christmas 2015 and started writing the book a fortnight later. As soon as it is published, I plan to contact Brian May, thanking him for being such an inspiration. So, the image of a hand on a window, with blackness on the other side. The issue was, this spoke too much of isolation and despair, and I hope that this is also a novel about hope, albeit in a dark world. What I wanted to convey was the idea that life often throws the proverbial at us, but we can always look upwards, outwards, and see hope. There is a lot of false hope in the novel: the red apple that the workers at Dawns’ Laboratories wear; the way Oscar 70 is presented to everyone on Earth; the name “Dawns” itself…But there is also a lot of real hope. Hope that the world will be better one day, and not just because it would make it better for me. It’s perfect, Emma. Thank you. If you wonder where I am for the next fortnight, I’ll be proof-reading and writing my blurb! I have a confession to make, and I apologise in advance. You see, despite reaching the ripe old age of 33, I still think, and sometimes act, like a moody teenager. I don’t mean that I hate my parents and refuse to clean my room. Rather, I mean that I enjoy a good sulk and brood as much as the next person. I was talking to a friend of mine over drinks recently and we got onto the topic of Tragedy, as English teachers often do (if they are speaking to me over chenin blanc anyway). My friend mentioned the idea that, as humans, we like to feel strong emotions, even the bad ones. That old adage: it reminds us that we are alive, etcetera. Fair point, but any emotion? Really, any? Overwhelming personal grief? Daily, grinding anxiety? Surely not, I said. Sadly, many of us can cite personal horrors, but revisiting them as a reminder of our fragile humanity is hardly fun. No, he conceded. This is where fiction comes in. Most people know about catharsis – ridding oneself of negative emotions – and to do this with a world that is, when all is said and done, not real, perhaps has some credibility. Is that why I am so cruel to some of my characters? There is an element of that. After all, a book that makes a person cry is often, in my view, a very, very good book. I’d like to think that I’m making a larger point through the suffering of my characters, but perhaps my friend is right: maybe it is all about how a story makes us feel. At the very least, strength of emotion is a good starting point. Unfortunately, a cursory glance at any society at any point in time will show you suffering and injustice, so perhaps this is why so many literary works lean on such a theme. I still believe though, that to rise out of suffering and injustice is a nobler act than wallowing. Easier said than done, of course, but I force some of my characters to do it regardless. Let’s find out a little more about Martin. The aged beams of Kolwick Library yawned with each gust of wind outside as Martin, its sole visitor, pored over volumes of useless and irrelevant fiction. Anything deemed helpful to the Cause was apprehended years ago, and Martin’s heart ached a little to see volumes of Shakespeare, Milton and Harper Lee gathering dust on the shelves, rejected and left to wither, until the time would come to use them for fuel. The other Supplementaries in his Unit had mocked his love of reading. Most Sups, on failing the test, gave up such pointless enterprises, but Martin had been determined to redeem himself in the eyes of his mother and stepfather. Both successful teachers, they had been shocked when he had achieved a painfully close to the pass-rate score of 58. He felt cold as he remembered their faces when he told them in the waiting room. He had expected a hug, a smile, some form of reassurance, but instead they looked at him as though he was a puzzle to solve – a jigsaw that they had been working on for years only to find, just before completion, that a piece was missing. Because of course he had presented them with a real problem. Anyone over the age of forty had been excused from testing just after the Expansion (an older Martin thought wryly that this was of course nothing to do with the fact that the youngest member of the Panel was forty-one) so his parents had been exempt. For this he was glad. Despite their clear love of learning and knowledge, they had no Scientific understanding whatsoever, and their particular field of expertise was moribund in a world hell-bent on progress. His elder brother and sister had passed, and had achieved the status of Betters. For failing to tick the final box at the age of eleven, he was eternally sorry. His main memory of that day was not knowing what to do with his hands as he stood before them all, delivering the news that he had failed them and he really wasn’t sure why, or what it meant. His mother had wept, his stepfather couldn’t look him in the eye, and Dinah and Joseph had been sent to stay with their grandparents. Martin’s sole comfort was that his father was safely locked away and never to be heard from again, so at least he wouldn’t be beaten for this. The year had been 1997 and Martin had been a part of the first wave of children to be declared Supplementary. The guidance from the Panel was very clear: anyone scoring below 60 was no use to the Cause and was therefore living on borrowed time on this planet. All Sup children must report to their nearest Supplementary Unit for further assessments and reassignment. Martin paused on his page of Genesis 22: And they came to the place which God had told him of; and Abraham built an altar there, and laid the wood in order, and bound Isaac his son, and laid him on the altar upon the wood. And Abraham stretched forth his hand, and took the knife to slay his son. Surely the Panel had never thought that it would be so easy. To tell thousands of parents that their children were worthless because of a seemingly arbitrary test was incredulous. Except it had worked, largely. There had been tears, protestations, demands for retests (which were always, without exception, refused, of course) but in the end, parents had largely seen the bigger picture that the Cause presented and waved their children off, telling themselves that these Units would care for them well, until the time came to release them again. Yes, they would never bring them grandchildren, but that was the price they had to pay as good citizens. And with the world so overcrowded, and with resources so scarce, they could see the point the Panel had made. So children had been waved off in their thousands, sent to Supplementary Units for a life of hard labour and abuse. But Martin’s parents had been different. Both of them were academics with lofty ideals, and they had, after a painful day or two debating the issue, refused to give up their son. They had refused because they loved him, and it was the worst crime they could have committed. His memories of the following months were hazy. He remembered a lot of hiding, and being terribly hungry, the latter of these things being something he was now unfortunately used to. He also remembered the elation of being rescued from his fate, the feeling of being loved so much that his mother and father would risk everything without a second thought. They travelled from hotel to hotel, and later on from one abandoned house to another, using up every penny they owned in ill-advised bribes, yet some of Martin’s loveliest experiences were sitting on his mother’s lap in a decrepit twin hotel room, reading her much loved and tattered Bible, searching for meaning in a world rapidly becoming devoid of it. He remembered her long red hair flowing like a mermaid’s down her shoulders as he nuzzled close to her. He remembered the sweet scent of her mid-price perfume. He remembered feeling safe, and loved, and warm in her arms. His stepfather, who had previously been happy to settle with a volume of Chekhov, had more recently taken to scouring the newspapers for updates regarding current policies outlining the advised treatments of Sups. Martin had never been a particularly happy child, and a constant source of guilt to him as an adult was the fact that his runaway months had actually been the happiest of his life. His parents had told him everything would be fine, so they would be. More importantly than that, Martin was now the centre of their universe. Dinah and Joseph were enjoying a life as Betters, back at his grandparents’ home, so he savoured the experience of his parents’ undivided love. They could not do what Abraham had done because they loved him so much, despite their unbending Christian faith, and that had made his heart swell. The Cause was not, after all, God, they had said to him, with a smile. Their love had made him feel safe. He was almost invincible under their reassurance and protection. Martin was far too young when he learnt that your parents can’t protect you from everything. The Panel Representatives had found them early in the morning, in a quiet seaside hotel. Holidaying had been a redundant pastime for many months at this stage, and the couple who owned the hotel had seemed very happy to gain custom from a lovely family “passing through.” It was too late to learn that they had turned in many families during that first year, and had actually received recognition from the Panel for their services to the Cause. The most dominant memory from that dark morning was his mother’s screams in the next room. He never actually saw what happened, as he was bundled into the back of a battered blue minibus. His mind raced with hideous possibilities and it raced still, as he sat in this cold and abandoned house of knowledge. He did see his stepfather run out in pursuit of the vehicle, though, and he saw the explosion of blood as the guns stopped him going any further. Martin closed the book with a snap. The silky thin pages slid together, to remain in this position for many weeks before his return. Enough indulgence in past thoughts.